There are no rental cars and very few four-wheeled vehicles operating in Les Saintes. Most visitors do their exploring by scooter, bicycle or on foot. A few taxi-minivans are available for island tours. They carry 5-10 passengers and generally provide two-hour tours, including a stop at Fort Napoléon. Scooters are available for rent in various locations near the pier and in the small town of Bourg. A credit card deposit is usually required as damage insurance. 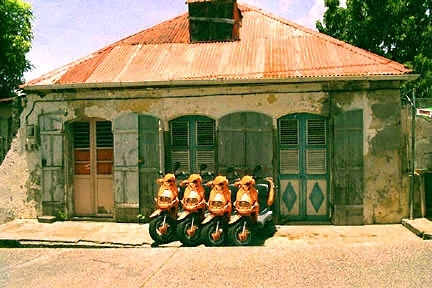 Although the scooters can carry two passengers, we recommend only one person per vehicle on the hilly, twisting island roads unless the driver is experienced. Scooter riding is prohibited in town from 9:00 to noon and from 14:00 to 16:00. Standard bicycles and mountain bikes are also available for visitors in good physical condition. For a small fee, shuttle boats (navettes) make round-trips between Terre-de-Haut and Terre-de-Bas five times per day, making stops at the Hôtel Bois Joli dock if requested. Please click here for a directory of scooter, bicycle and taxi resources.